According to Wikipedia, The avocado is a tree native to Central Mexico, classified in the flowering plant family. Avocado or alligator pear also refers to the fruit (botanically a large berry that contains a single seed of the tree. Alligator pear – The skin of avocado does look like alligator and the shape of avocado looks like a pear! 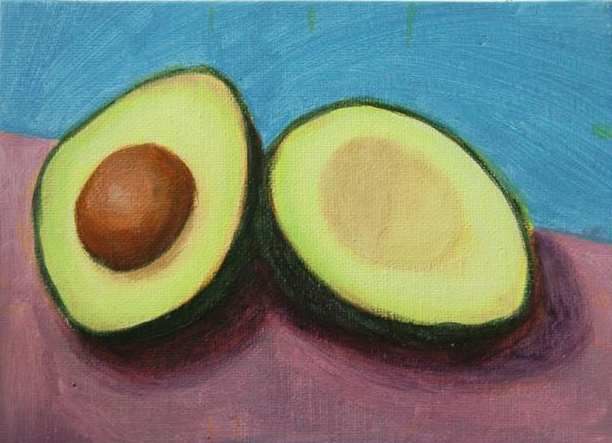 Anyhow, when I was painting this avocado in half, I was kind of a little bit more relaxed than I usually am – I mixed the yellow and white, and painted it on the canvas panel. 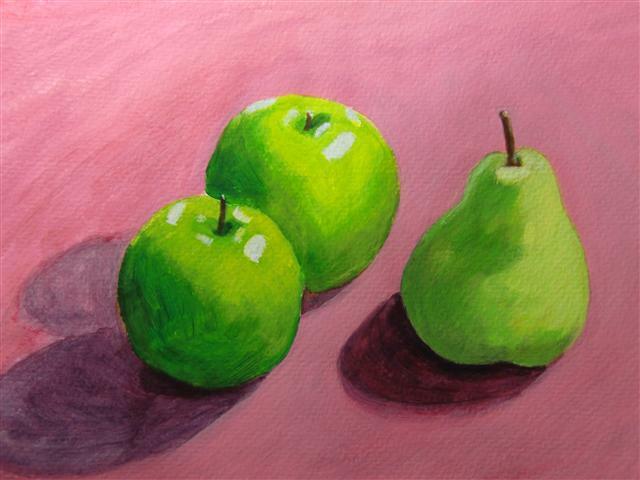 I also used wet on wet technique in the fruit area. I like the way it turned out – it looks convincing. I think the shadow area needs to be improved but I will leave it for now. 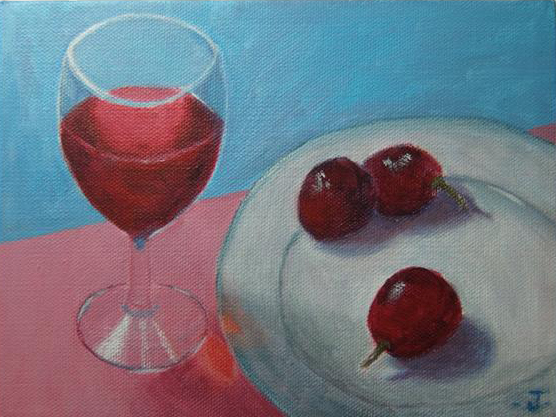 Glass is an interesting painting subject in still life. Transparency can be seen in the distortion, reflection, background color and shadow. I like the composition of this painting. In this painting, I was also experimenting how the background color impact the overall composition. I left a small corner of pink on the right behind the white plate – the little piece of pink balance the whole picture. A little bit color repetition works well in this painting. 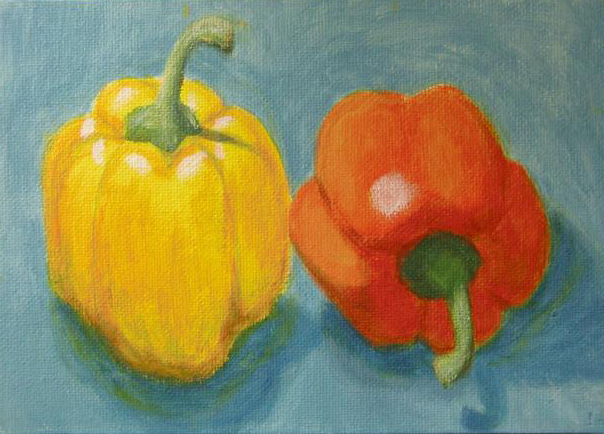 Love the color of bell peppers, especially yellow and orange. Here is another painting in acrylic. 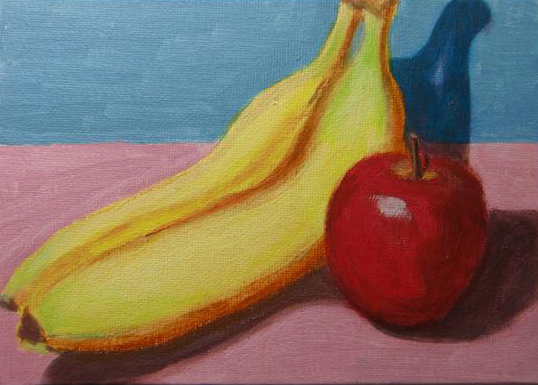 Apple and Bananas again. 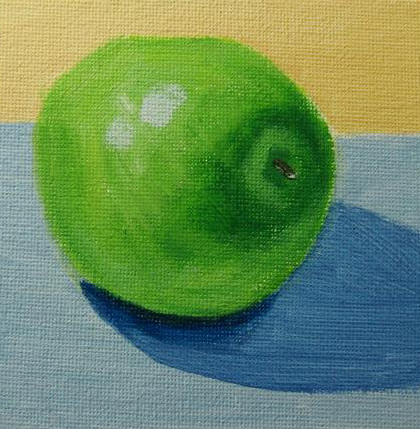 This time it’s a painting from life, not using a photo and painting as a reference. I like the colors and composition. 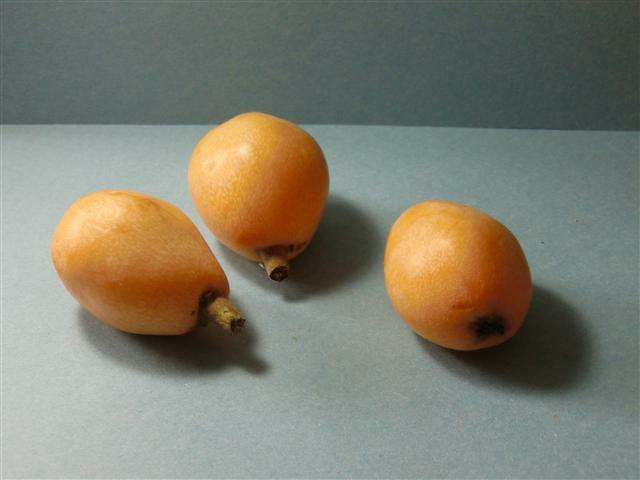 Have you even had loquat? 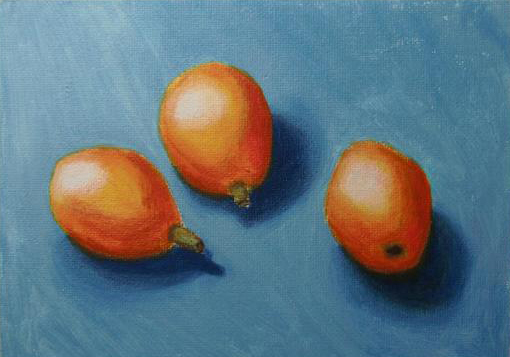 It is one of popular fruits in southern China. A little bit sour and sweet and nice yellow color. 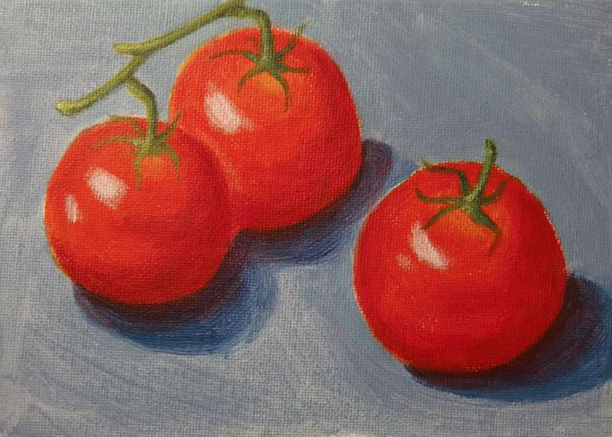 Tomato is one of my favorite fruits. I planted quite a few tomatoes in my garden last year and they taste sweet and fresh. I am planning to plant more this year. 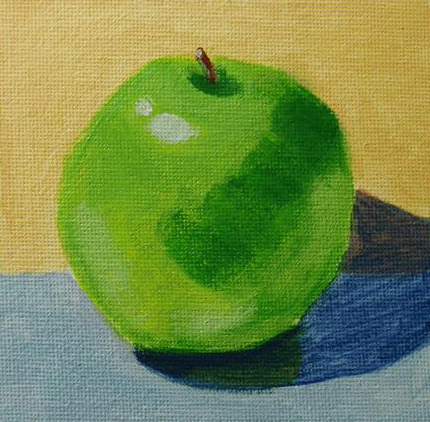 Speaking of my acrylic painting, I should focus on value and fewer brush strokes. 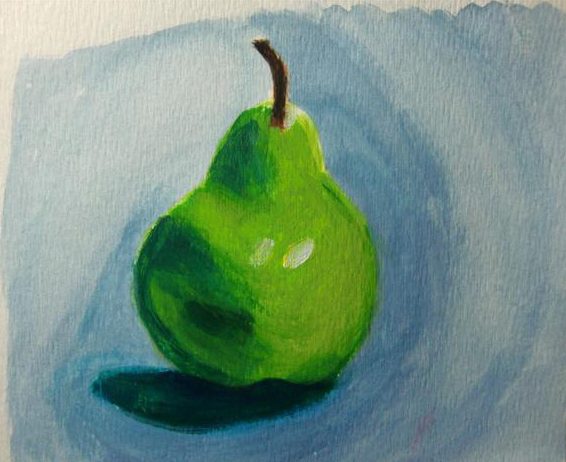 Pear has interesting shape and it’s one artists’ favorite painting subjects. I couldn’t find a good looking pear in a typical shape. That’s what I can get the best at this season. Again, the color is not even close to what it looks. Too green.